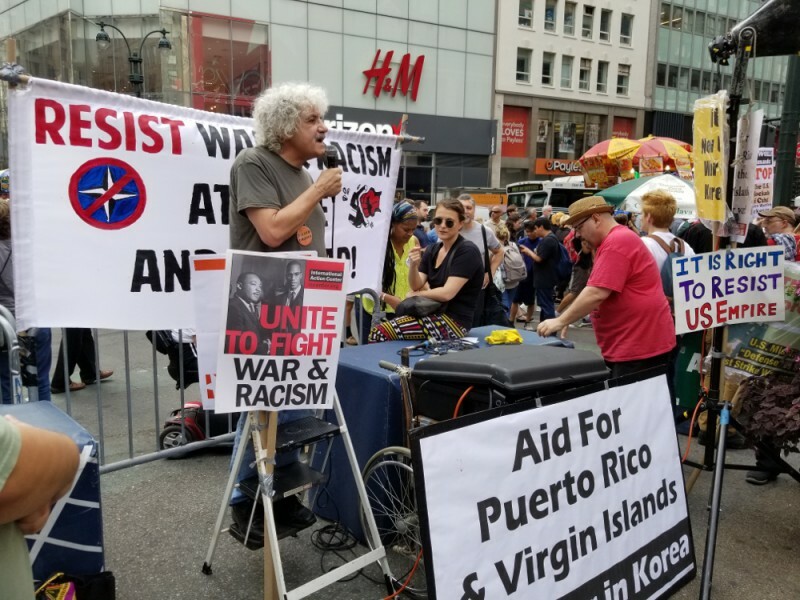 New York rallies against 16 years of war | Fight Back! New York, NY – Around 150 people gathered in Herald Square, Oct. 7, to protest war at home and abroad on the 16th anniversary of the invasion of Afghanistan. 50 groups signed on to the call to action to oppose U.S. imperialism. Bayan USA spoke about how the U.S. wars affects the Philippines under the rule of Duterte. SPARC (Serve the People – Awaken Revolutionary Consciousness) spoke about how imperialism is closely connected to gentrification at home and displacement of working class and oppressed people. Worker’s World Party spoke about the need to support nations, such as Venezuela and Korea, targeted by the U.S. The rally ended with powerful words from one the three emcees, Nerdeen Kiswani from New York City Students for Justice in Palestine who urged all the attendees to not let this event be the only thing they do, but to join an organization and join the movement.